The historical city of Kruja is situated about 35 km away from Tirana capital. It is a center enters of cultural and historic heritage. Located at an altitude of 608 meters above the sea level, Kruja is also called the “white city” since from the city you can see the Adriatic seashore. Known as the center of Albania in medieval times and the city of Scanderbeg National Hero, Kruja is the city that best represents Albania for its historical background, and as its residents say: “Who has not visited Kruja, has not visited Albania”. 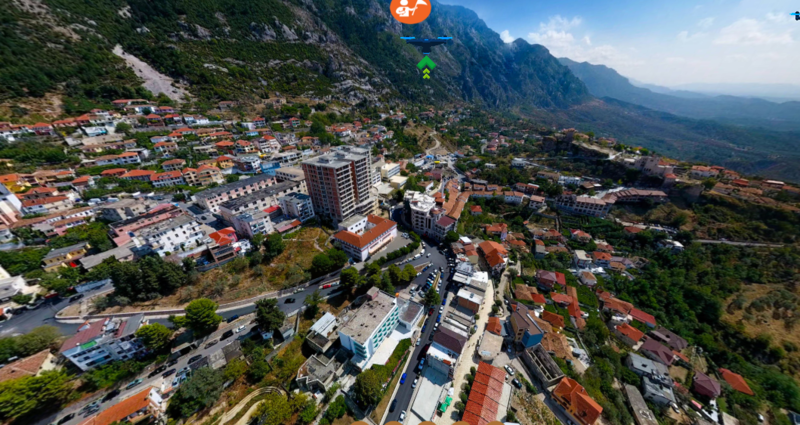 Those who have not visited the city yet or feel nostalgic can take Kruja Virtual Tour. This virtual tour takes the visitor at the City Center, the Old Bazaar, the street to the Castle, the Castle, to the National Ethnographic Museum and much more. Besides the Bazaar sounds effects, visitors can enjoy music from Skanderbeu movie such as the famous music score by Cesk Zadeja and the Song for Gjergj Kastrioti sand by Luke Kacaj. On the road to the Castle, don’t miss the old man by the fountain playing ciftelia. Kruja is a city known for the high number of tekkes and shrines inherited from the past since the city was the center of the country during the 500 hundred years rule of Ottoman Empire. The oldest among them is the Teke of Dollma in the premises of Castle. 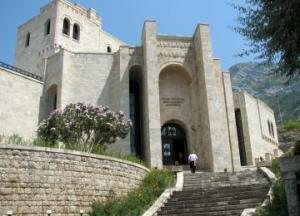 meanwhile, the most known and visited is Sarisalltik Teke, situated on Kruja Mountain about 6.7 km away from the city. For most of the believers from all regions of the country, this is a holy site, which is visited by pilgrims on every day observed by the of Bektashi believers and not only them. The Mountain, as called the saint place, gets visited not only by thousands of believers but even by tourists who are curious in exploring “saint places” (as called by believers) in Albania. The city is well known for its ancient bazaar, situated in both sides of an old street paved in cobblestones, which in past centuries was wider than it is nowadays. The bazaar has its traditional wood shops where once upon a time were centers of handicrafts and masters of embroidery, weaponry craft, etc. During the entire year but mostly during the summer season, the old bazaar hosts many visitors, mostly foreigners which buy old souvenirs, fezzes, wood crafts, and rugs. Near the bazaar, tourists often visit an XVI century mosque, built by the Ottomans. 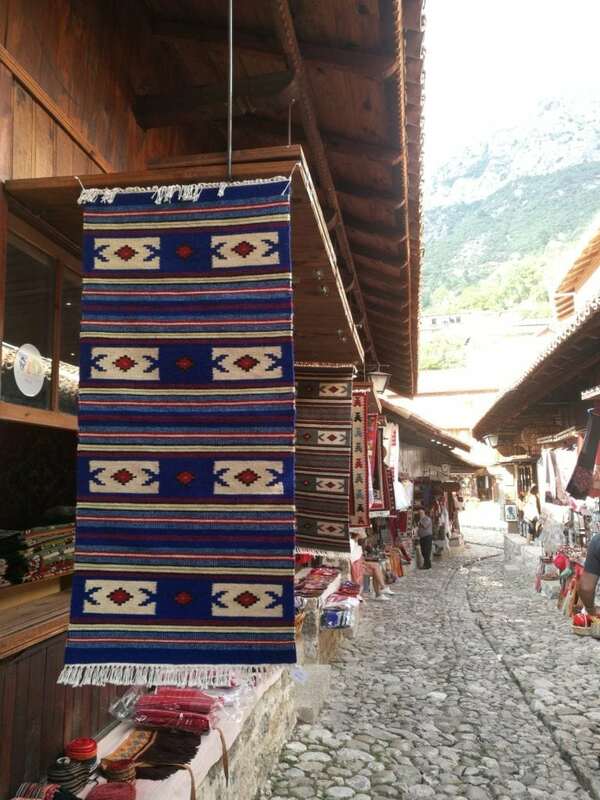 The Bazaar of Kruja is the real testimony of Albanians’ old traditions which continues to save and inherit the values and characteristics of the country’s culture and traditions. One of the most visited and an attractive place in Kruja city is the National Museum of Gjergj Kastrioti, Albania’s national hero who fought against the Ottomans for decades until the day he died. 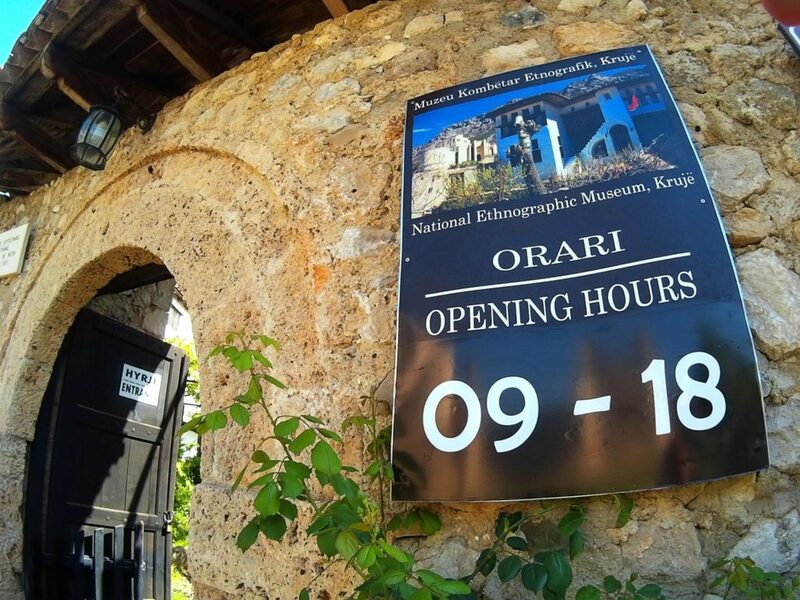 The Museum is located inside the Castle of Kruja, another reason why it gets visited by thousands of tourists who are interested in knowing Albania’s history and culture. Inside tourists cans see a copy of the helmet and the sword of Scanderbeg in the main hall, the flags and stems of important families of that time who supported the national hero. Tourists also will see a huge mural painted by Naxhi Bakalli, which testifies the important battles which took place near the Kruja fortress. In the museum are also showcased portraits, paintings, and books written for the figure and battles of Skanderbeg in the third store of the building. The museum was finished in 1982 and hosts approximately 100 thousands of visitors during a year. This Museum is located in an old building of the Toptani family, built in 1764 in the courtyard of the medieval castle, in front of the National Museum of Scanderbeg. The walls of the museum have 250 years original murals, ceilings carved in wood, very rare furnishings, old style rugs, and traditional costumes. Inside the house is a steamy Turkish bath, one of the only left in Albania. The museum has also 1,200 original objects which are living proof of old Albanians’ lifestyle and traditions, mostly in XVIII-XIX centuries. Another feature that makes this museum unique is its architecture where the first floor used to be the place of ateliers and cantinas and the second floor was used for living. In this museum, tourists can see the old traditional wearing for men and women, musical instruments and old weapons. 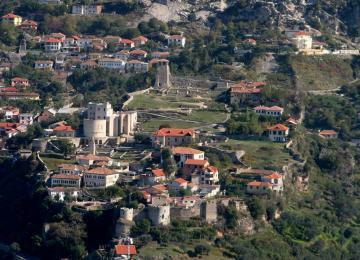 The area of Kruja is known for its numerous springs, from which the city has taken its name (spring in the Albanian language is translated as krua, krua-Kruja city). According to history, at the beginning of the first millennium, the city and the areas around it had more than 30 springs, most of which still exist nowadays and have their own stories and legends. One of them is Ballabaneci spring, which as the legends say, was named after a Turkish Pasha was killed nearby. Behind the medieval Castle of Kruja, tourists can see the Taslloi spring and a giant oak with the same name as the spring. A much-visited spring is Qafe Shtama, which is well known for its fresh and clean water, located in the National Park of Qafe Shtama, at an altitude of 1200 meters, in a 15 km distance from Kruja city.